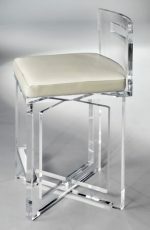 Buy Clear Acrylic Bar Stools - Free Shipping! 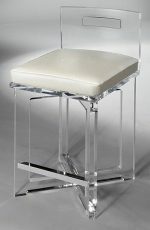 Clear acrylic bar stools go great with any modern or ultra-modern kitchen. They’re sleek and contemporary, and they make a strong statement with a funky ambiance. 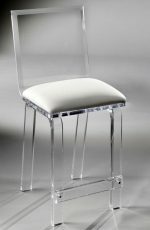 Acrylic stools usually have metal frames made of chrome, nickel, or aluminum. 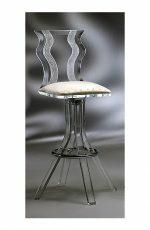 Legs are often thin and tubular, but they can also have a pedestal base with a rounded baseplate. Choose soft gray taupe for three walls, then add an accent wall in seafoam green. Install black cabinets and stainless appliances. For the kitchen island, use a black base with a stainless steel countertop. Install light-colored hardwood floors to balance the black of the cabinets and the island base. 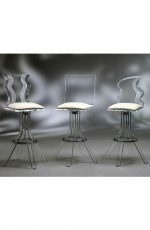 Last, add stools at the island with chrome frames and seafoam acrylic seats and backs. This creates additional balance and matches the accent wall. Accessorize with light and medium shades of plum, but not too much. A splash of color goes a long way! Possible accessories include contemporary wall sculptures, floral arrangements, window treatments, and any other decorative items you can find. Click here to read our guide for adding color to your kitchen. 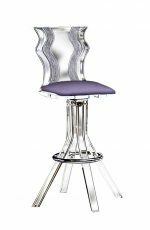 Acrylic barstools are easy to move around because they’re sleek with lightweight seats. They’re just as durable as steel or wood, especially when you add a strong metal base such as steel or chrome. All stools from Barstool Comforts come with free nylon glides to protect your floor. If your floor is hardwood, linoleum, or any other solid flat surface, you can add stick-on felts to the bottom of your stools’ feet for additional protection. If your floor is tile, then the nylon glides are all you need. 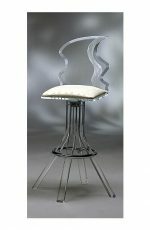 What are acrylic bar stools made of? 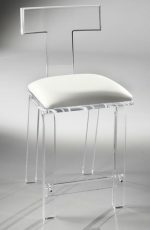 Acrylic stools’ seats are made of acrylic resin, which is a hard, transparent plastic. The scientific name is polymethyl methacrylate (say that ten times fast!). Acrylic resin is highly weather-resistant and is frequently used in car tail lights, plastic fixtures like towel racks, and consumer electronics. To clean your acrylic stools, use only mild soap and water. Avoid abrasive cleaners because they’ll scratch the acrylic. 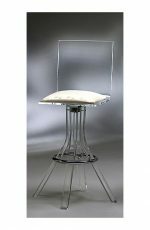 Wipe clean, wet or dry, with a soft microfiber cloth and your stools will last for many years to come. If you have any questions, please feel free to email or call us and we’ll be happy to help. We love talking about barstools and interior design, and we’re always ready to help you choose colors and styles. You can even email us a picture of your kitchen or bar and we’ll give you free design advice!